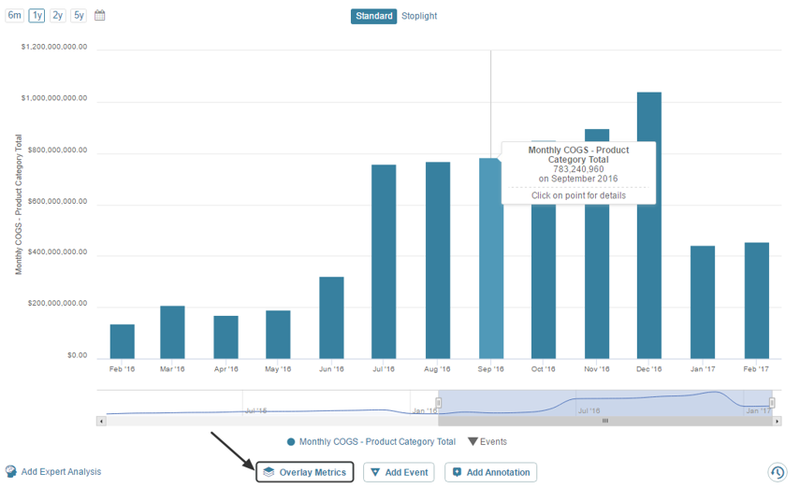 Metric Insights provides the ability to compare a metric to other different metrics in order to spot any emerging trends and review the results of various events. This differs from the Multi-Metric elements in that you can manage overlays by adding and deleting them from the main metric without having to actually author a new element. This section provides an overview of this feature, with links to provide more detail as needed. To add an overlay Metric to your Chart, click Overlay Metrics below the Legend of this Chart. 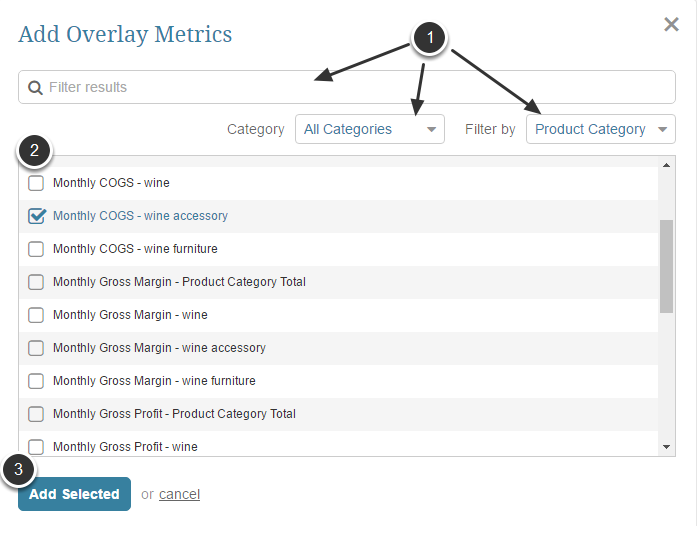 The Overlay Metrics pop up opens. 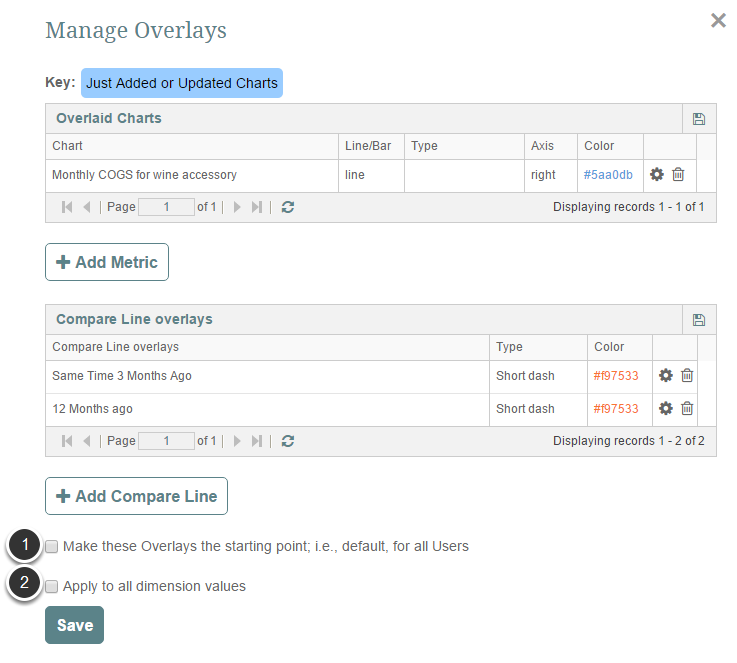 To edit the Overlay Chart, click Change Overlay Chart options button for the corresponding metric as shown in the left picture. The Overlay option screen opens. Color. If several charts are laid over the original one, every additional metric is going to be of its own color. To change the color of the metric, click the Eyedropper button to the right of the Color field and single-click a new color from the palette to select it. Type. Select how you want your chart to be displayed. The available view options are: 'line' and 'bar'. Line Type. This field is shown only if 'line' value is selected in the field above. The line of the Overlay Metric can be dashed, dotted, etc. 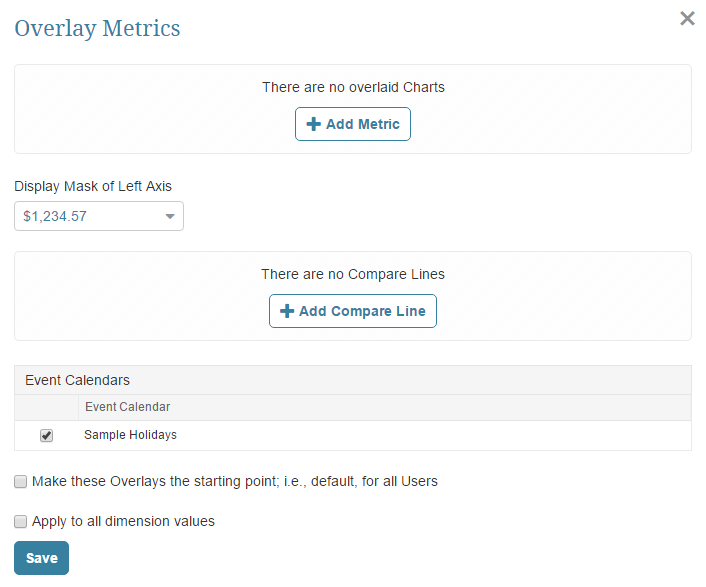 You can select different line types for different overlay charts. Axis. It is recommended to place the Axis of the Overlay Chart on the right side of the original chart. 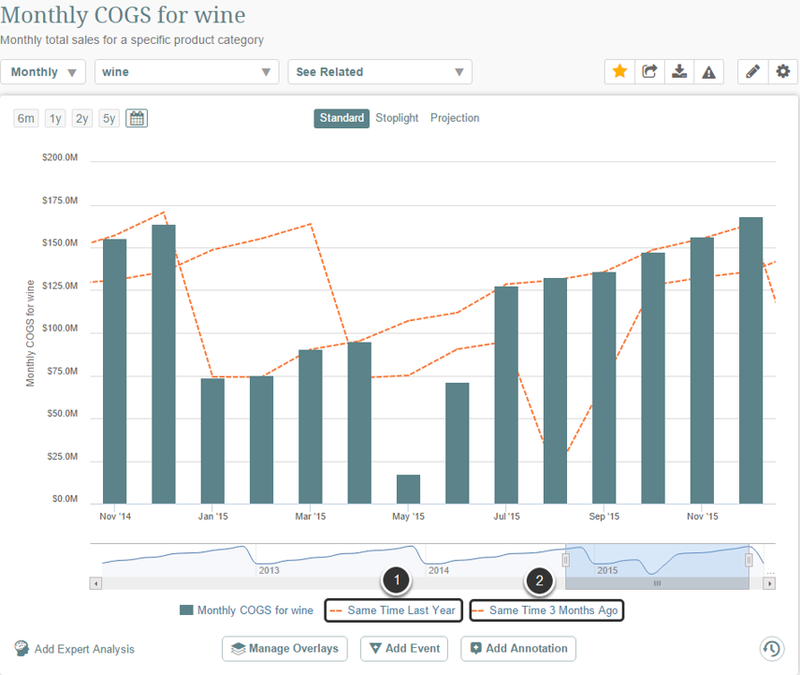 In the example above we have added Monthly COGS for wine accessory chart to the original Monthly COGS for wine chart. 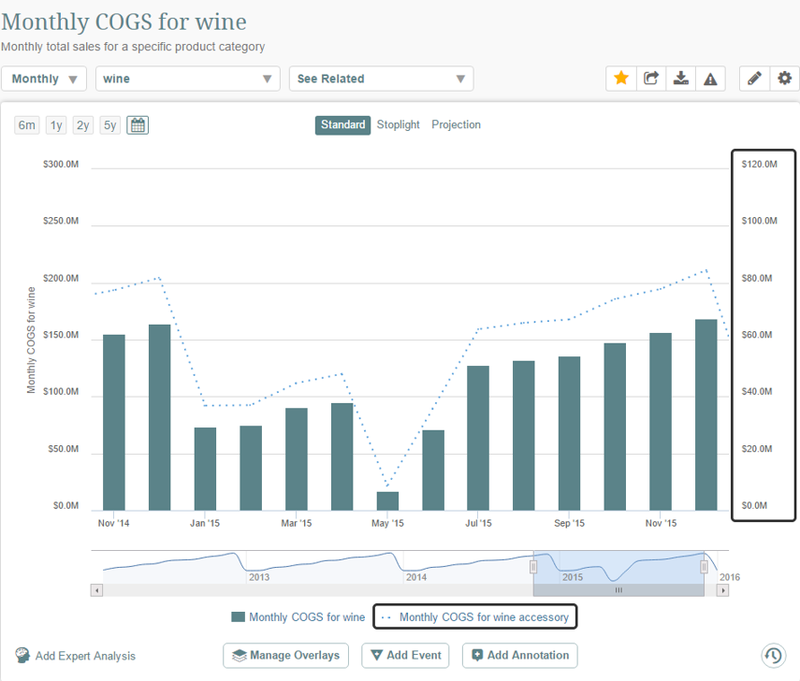 The Monthly COGS for wine accessory chart is shown as a dotted line and its Axis is displayed to the right of the chart. NOTE: To hide the Overlay Chart, single-click its Legend below the chart. When the Overlay Chart is hidden, its Legend is shaded. Compare Lines can be added to analyze current metric and the same metric at some point in the past. Check the box(es) for one or several time periods in the list. 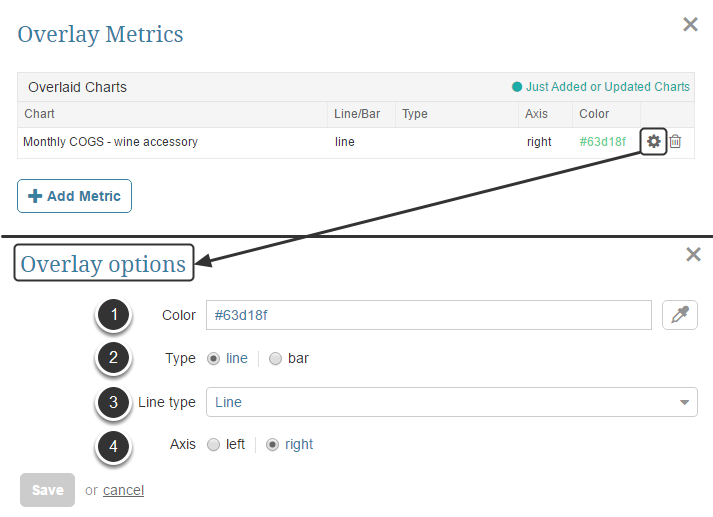 Click Add Selected to add Compare Lines to the original Chart. Color. If several Compare Lines are laid over the original Chart, they are usually of the same color. To change the color of the Compare Line, click the Eyedropper button to the right of the Color field and single-click a new color from the palette to select it. Line Type. Compare Lines can be dashed, dotted, etc. You can select different Line types for different Compare Lines. NOTE: To hide the Compare Line, single-click its Legend below the chart. When the Compare Line is hidden, its Legend is shaded. Make these Overlays the starting point - If this box is checked, all users, who open this chart are going to see added overlays. Apply to all dimension values - If this box is checked, added overlays are going to be displayed at the charts of all dimension values. If the Metric is not dimensioned, this field is not shown at the Manage Overlays screen.